Lying with the belly, chest and legs on the mat raise the legs and upper body. Push the legs together to engage the gluts further. Point back through the toes or ballpoints or the toes. There are many different positions for the hands and arms. They can be interlocked behind the back to increase shoulder flexibility or interlocked behind the head. The hands and arms can also be stretched out in front of you. If you find this posture too hard to perform try it with just one leg off the mat. It is a very therapeutic pose for building back strength and relieving bulging discs. Deep muscles in the spine are strengthened such as the multifidus, iliocostal lumborum, longissimus thoracis, iliocostalis thoracisis. longissimus cervicis, longissimus capitis and the iliocostalis cervicis, spinalis thoracis. To raise the head up and back the Spinalis capitis and semispinalis capitis are tightened and strengthened. This pose is part of a Yoga for Back Pain sequence. This is an excellent yoga posture for back strength. 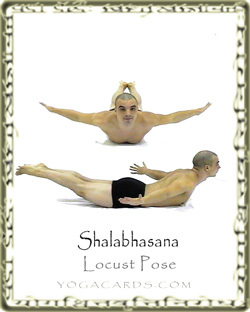 There are a number of variations of this pose and the should all be performed.